I had been putting off on trying to make any kabab (kebab) or skewered / grill-cooked recipes as I do not have an outdoor or electric grill and did not want to go the whole way if it wasn’t going to turn out as it would on a real tandoori oven or grill. But recently, I stumbled upon a Punjabi version of the kababs where the chef uses cooked gram flour in the marinade for a nutty twist and it seemed too good to pass up without trying. I decided to overlook the cooking method and just trust the goodness of the flavor from the marinade, and guess what – it was completely worth its while! So, for all those home chefs out there who’d like to try their hand at kabab-making but do not have a grill/tandoor, here’s how you can make it in your conventional oven. If you find the quantities a bit much, go ahead and cut it down to half – I have a big family to feed right now and super sizes are what works these days! Drain out all the water from the cleaned and cut chicken and set aside. Add all the ingredients except the oil and gram flour to the chicken and mix well. Gram flour paste: Heat the oil in a pan and add the gram flour on med heat stirring immediately to prevent burning. The gram flour would cook within a minute, so you can turn off the heat as soon as you notice light browning. Pour the gram flour mixture (with the oil) into the chicken and give it a good mix. Refrigerate to marinate for at least 2 hours. You could let it sit in overnight or even a day or two if you have excess. Note: If using bamboo skewers, soak in water for 20-30 minutes to prevent burning. String in the chicken pieces into the skewer (4 or 5 per skewer depending on the size of the chunks). You could come up with any pattern you like – alternating the meat with the peppers and tomatoes or any other choice of vegetable like onions, etc and prepare the skewers. Place the skewers in a baking tray and place it in the lower rack of an oven pre-heated to 450 degrees F.
Flip it over after 15 minutes to bake the other side. After another 15 minutes, set the oven on broil-mode and broil each side for 5-10 minutes to get some browning. Bake side1 for 15 mins -> Bake side2 for 15 mins -> Broil side1 for 5 minutes ->Broil side2 for 5 minutes and you are done! Sprinkle some lemon juice on the kababs and garnish with chopped onion and tomato rings. 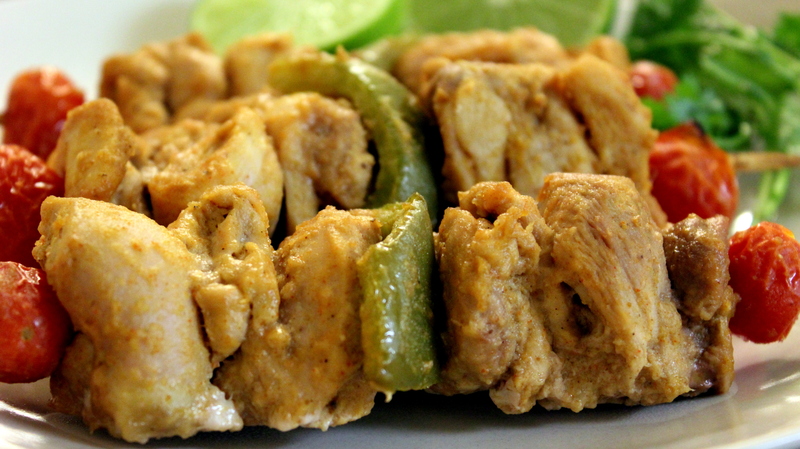 The same marinade can be used to make paneer kababs, vegetable kababs, or a mix of chicken or any other meat and vegetable kababs. To get grill marks and more of the grill-cooked texture, you could finish up the cooking on a stove-top or electric griddle with grooves if you have one. hi dear nice preparation,,one question I have is in otg should I choose bake option to do this for first 30mins or grill option which one is right i am indeed confuse can you please help me with this? Hi Sangeetha.. I haven’t used an OTG, so might not be know much about it. But from what I can see on the internet, I understand that with the bake-option only the bottom rods/coils heat up, and with the grill option both the top and bottom rods heat up. So whenever a recipe calls for bake – you should be using the bake option, and when it calls for broiling/browning at a high temperature, the grill option would be the one to choose. So start with the bake option, allow the chicken to cook, then use the grill option to get the browning/crispy outer texture, Hope that helps! !